How to get from Colombo Airport to Kandy? Kandy is one of the largest city of Sri Lanka located in the central province. It is the cultural capital, and it is the heritage site of Sri Lanka. Kandy is a very beautiful city surrounded by rainforests on all sided and is a home to lots of exotic animals. Kandy houses many famous temples, shopping centers and there is a wide range of dining options. The world famous Temple of the tooth is located here. 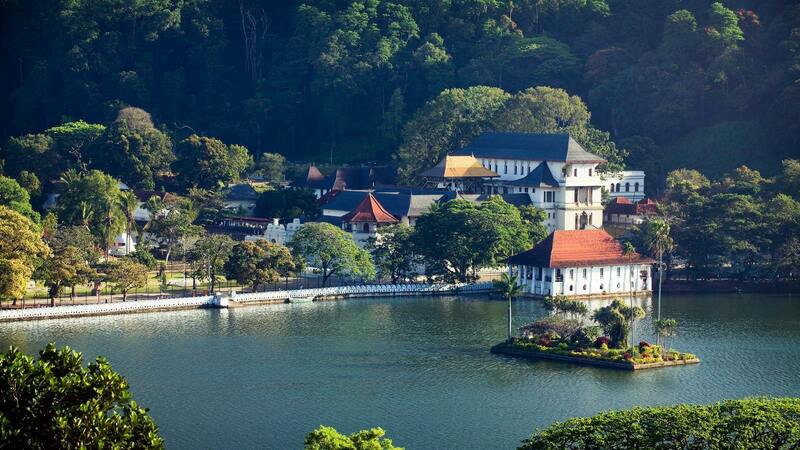 One who visits Kandy will have a complete experience of the culture and heritage. There are frequent buses running throughout the day and night between Colombo city and Kandy. Traveling on a bus from Colombo city is quite cheap when compared to transfer services. There are free shuttle buses from the Colombo International Airport to Katunayake bus stand or you can pick up atuk tukto get dropped at the bus stand and the will be 100 LKR approx .60 USD and would take 20 minutes to reach. From the bus stand you can get on to bus No.5/245 to Kurunegala and from there bus No.609 goes to Kandy. The average cost for the travel would be 300 LKR approx 1.81 USD in a normal bus and 389 LKR approx 2.5 USD for an air-conditioned bus. The total travel time would be about 3hs -4hrs. Though it is cheap to travel on a bus, it is not very comfortable. At times the waiting hours can prolong up to 2 hours before you could catch the next bus. Also, there is no guarantee that you would be allotted with seats, it merely depends on your luck. Taking a ride on the local bus can be an adventure if you travel light. Taking the train journey from Colombo to Kandy can be the most economical and comfortable journey if plans are made well in advance. There are lots of trains operating from the Colombo Fort to Kandy and the travel time is about 2.45 hrs to 3hrs. It is the most scenic journey, as Kandy is the hill station with lush greenery all around. TheInter cityExpress trains and the Colombo commuter trains are available from Colombo Fort to Kandy. The intercity express being faster and the commuter is the slow train. Reservations need to be done for the intercity express and it can be done up to 30 days prior to travel. The tickets are usually on demand, so it is always better to make your bookings as soon as you are in Sri Lanka. There are no online bookings for train tickets in Sri Lanka, you can either use an agency to reserve your tickets or go to the Fort station directly and make the bookings. The average costs for a second-class ticket are 1600 LKR and 2100 LKR for a first class ticket. Booking a transfer service from Colombo Airport to Kandy is the fastest and the most comfortable mode of transport.There is no actual wait time when we use a taxi service for transfer and it is available 24x7. Bookings can be made in advance onwww.airporttransfer.lk. 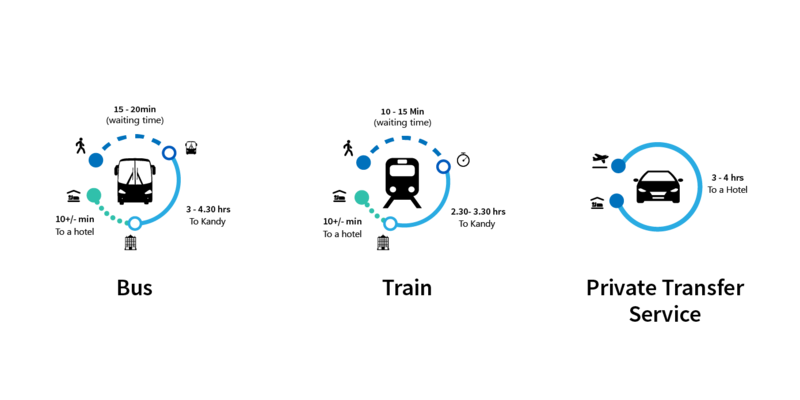 Once booking is made our driver is ready for the pickup and he waits close to the arrival point and helps you with your boxes and drives you safely to your destination. The travel time is about 3hrs and there will be no extra hidden costs charged. The cost from Colombo airport to Kandy in an economy class of car will be 10000 LKR approx to $ 65. You can reach the desired destination with ease and hassle-free. Booking a transfer service from Colombo Airport toGalleis the fastest and the most comfortable mode of transport.There is no actual wait time when we use a taxi service for transfer and it is available 24x7. Bookings can be made in advance onwww.airporttransfer.lk. Once booking is made our driver is ready for the pickup and he waits close to the arrival point and helps you with your boxes and drives you safely to your destination. The travel time is about2.5hrs and there will be no extra hidden costs charged. The cost from Colombo airport toGallein an economy class of car will be 13000 LKR approx to $83. You can reach the desired destination with ease and hassle-free. Once you decide the place and dates of your travel, transfer services can be booked.Oncethe booking is confirmed our driver will be waiting for you at the closest arrival point. The car will be readily parked on the parking grounds. All our bookings come with a free wait time of 60 minutes for the airport and 15 minutes for other trips. The drop off location is already known to our (www.airporttransfer.lk ) driver and you can be stress-free in a foreign land. We make you feel at home. Private transfer services are best suited for tourists who carry heavy luggages and travel with family and children.When you book the trips on transfer services there are no extra charges for luggage. Our drivers are punctual and patient and will definitely help your luggages.